The 2013 hurricane season in Mexico is underway. The “official” hurricane season is from 15 May to 30 November each year for Pacific coast storms, and from 1 June to 30 November for Atlantic storms, though most hurricane activity is concentrated in the months from July to September. Hurricanes are also known as typhoons or tropical cyclones. The table shows the World Meteorological Organization’s official list of 2012 hurricane names. Note that male and female names alternate. Names are often reused in future years, with the exception of the names of any particularly violent storms, which are officially “retired” from the list for a long time. In their early season forecast for this year, Philip Klotzbach and William Gray, researchers at Colorado State University, expect hurricane activity in the Atlantic to be significantly higher than the 1981-2010 average. They write that, “The tropical Atlantic has anomalously warmed over the past several months, and it appears that the chances of an El Niño event this summer and fall are unlikely”. (A strong el Niño is likely to minimize Atlantic hurricane activity). 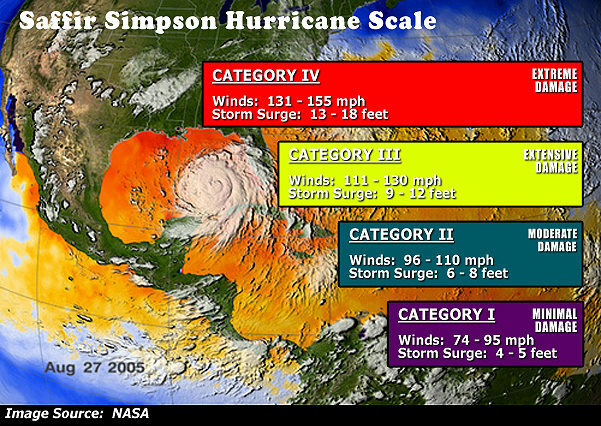 They predict that in the 2013 season 18 named storms will form in the Atlantic: 9 tropical storms, 5 moderate hurricanes (1 or 2 on the Saffir-Simpson scale), and 4 severe hurricanes (3, 4 or 5 on the Saffir-Simpson scale). These forecasts will be updated on 3 June and 2 August. For the Pacific coast, Mexico’s National Meteorological Service (Servicio Metrológico Nacional, SMN) is expecting 14 named storms: 6 tropical storms, 4 moderate hurricanes (1 or 2 on the Saffir-Simpson scale), and 4 severe hurricanes (3, 4 or 5 on the Saffir-Simpson scale). The SNM publishes regular updates on hurricane activity (in Spanish) on its webpage and via its Twitter account: @huracanconagua. How accurate was the forecast in 2012? The late season (3 August) prediction for 2012 (last year) was for 14 named storms in the Atlantic: 8 tropical storms, 4 moderate hurricanes and 2 severe hurricanes. In reality, the 2012 Atlantic season had 19 named storms: 9 tropical storms, 8 moderate hurricanes and 2 severe hurricanes. How accurate were the 2010 hurricane predictions? How accurate were the 2011 hurricane prediction?